When blog auto-publishing is enabled, a social post with a link to your blog content will be published on your social accounts when you publish a new blog post. These social posts include the blog post title, meta description, link, and featured image, and are published 15 minutes after the blog post is published. Blog auto-publishing is not available for Instagram accounts because links are not allowed on Instagram posts. Blog auto-publishing can only be enabled for shared social accounts. Unpublishing and republishing a blog post will not re-publish social posts to your social accounts. In the accounts table, click Enable in the Blog auto-publish column next to your social account. In the dialog box, click the Select a blog dropdown menu and select one or more blog(s). On August 1, 2018, Facebook will no longer support third-party applications posting to personal Facebook accounts. 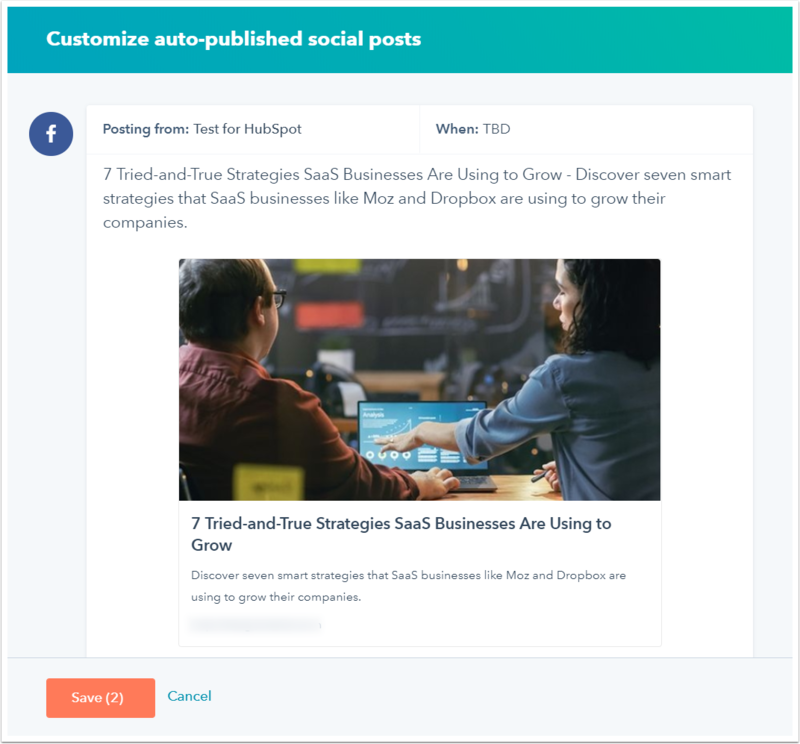 As a result, HubSpot will no longer allow posts to be published or scheduled to personal Facebook accounts, and they will not show up in the social composer. You can only enable blog auto-publishing for one Twitter account per blog. For example, if you have two Twitter accounts connected in your HubSpot account, you cannot set them both up to auto-publish for the same blog. 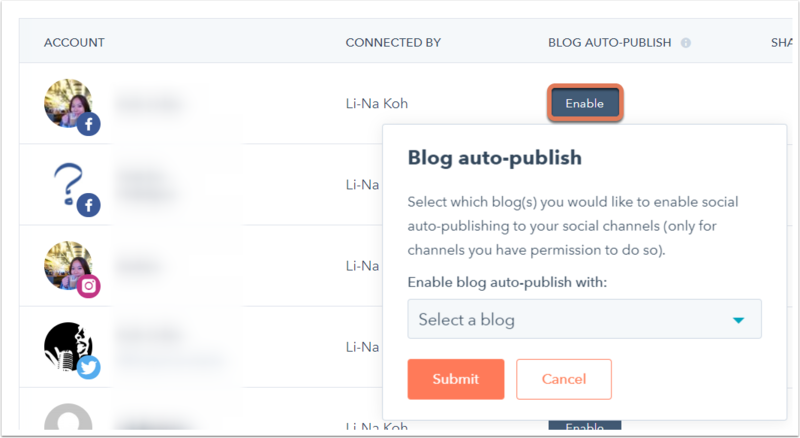 After you've set up blog auto-publishing for your respective blogs and social accounts, you can preview and customize the social posts that will be auto-published to your social accounts for each individual blog post. Please note: users who are Super Admins or have All accounts social publishing permissions can edit blog auto-publish posts in the editor. Users with Their accounts only, Draft only, or None social publishing permissions cannot edit blog auto-publish posts in the editor. In the Social auto-publishing setting, click Preview. In the right panel, the social post(s) to be auto-published will be populated with the blog post title, meta description, and featured image. A shortened link to the blog post will be generated and appended at the end of the social post after the blog post is published. Click into the post content to make any edits if needed. When you're done previewing or customizing your social posts, click Save. In the post editor, click Publish or Schedule in the upper right to publish your blog post immediately or schedule it for publishing at a later date and time. The social posts will be auto-published 15 minutes after the blog post is published. If you unpublish the blog post within the 15 minutes, the social posts will not be published.